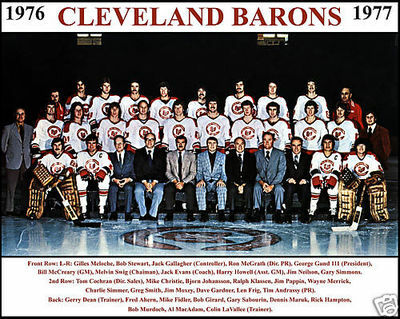 I am on the brink of the Third Annual Ultimate NHL Playoff and the ’76-’77 Cleveland Barons will be the representative for the extinct Cleveland franchise for the third time. They have bested the ’77-’78 Barons, again. The sweep began with a 7-5 win in Game 1 as Al MacAdam led the way with two goals and an assist. The game was tied after two periods, but two goals in the final few minutes, including an empty-netter from MacAdam sealed the win. The ’77-’78 Barons exploded for five goals in the second period of Game 2 to come back from a 3-1 deficit. However, the game was tied at six heading into the third period. The ’76-’77 Barons scored two unanswered goal in the third, though, including the hat trick goal for Dennis Maruk to win 8-6. Maruk, along with Mike Fidler, posted a three-point night for the ’77-’78 Barons in the loss. Then, in Game 3, the ’76-’77 Barons took control early and the games was over after just two periods as they led 6-2. The final was 6-4. It was Rick Hampton‘s turn to lead the ’76-’77 Barons as he scored twice and also tallied an assist in the win. The sweep was completed with a 5-3 win in Game 4. Frank Spring‘s goal a minute and a half into the third period turned out to be the series-clincher as he made it 4-2 and a Hampton PP goal nearly halfway through the period provided the icing on the cake. Up next is the Kansas City Scouts Qualifying Tournament! This entry was posted in Qualifying Tournament, Ultimate NHL Playoff and tagged Al MacAdam, Cleveland Barons, Dennis Maruk, Frank Spring, Gilles Meloche, Greg Smith, Mike Christie, Mike Fidler, Qualifying Tournament, Rick Hampton, Ultimate NHL Playoff. Bookmark the permalink.